Start Adobe Camera RAW and the main Photoshop screen is forced into the background. ACR floats on top of the main Photoshop screen while it’s in use, and much like the rest of Photoshop, everything you need is there, it just may not be obvious where. Photoshop and ACR are aimed sqarely at professional users, so have to be learned. The tabs on the right are well arranged and offer lots of extra functions for noise reduction, correction for vignetting, lens aberrations and color. If the main control panel is set to auto, I’d suggest changing it to Default. Apart from the fact that the Auto corrections just never seem to get it right, they obscure what you’ve actually got to work with. So I always turn them off. Once you’ve done that you see the pictures you actually took, not the auto level version. If you’re considering buying Photoshop CS5 because it will make it easier to get great pictures, that’s only true if you’re prepared to put a lot of time in to learning to use it. Adobe Photoshop CS5 may be the greatest imaging program there is, but it’s auto fix tools are usually about as useless as every other program’s. Photoshop’s great strength is the amount of manual control it gives you. That also applies to it’s RAW conversion module Adobe Camera RAW 6. In both cases there’s a lot to learn. Results from ACR with Nikon NEF files have always been pretty good, if not the best, but results with Canon CR2 files were poor. However, with ACR 6 that’s all changed. Adobe decided that a complete ground up rebuild of ACR was what was required to get back on even terms with the competition and, wow does it make a difference. At high ISOs in particular, Adobe’s RAW processing software is now about the best there is, leaving previous market leaders with a hill to climb. Although I prefer the Adobe Lightroom 3 interface, the ACR module is exactly the same in Photoshop CS5, so results will be identical. Which is the best Photoshop? To me now, it comes down to the workflow, or interface, and Lightroom 3 wins that hands down. 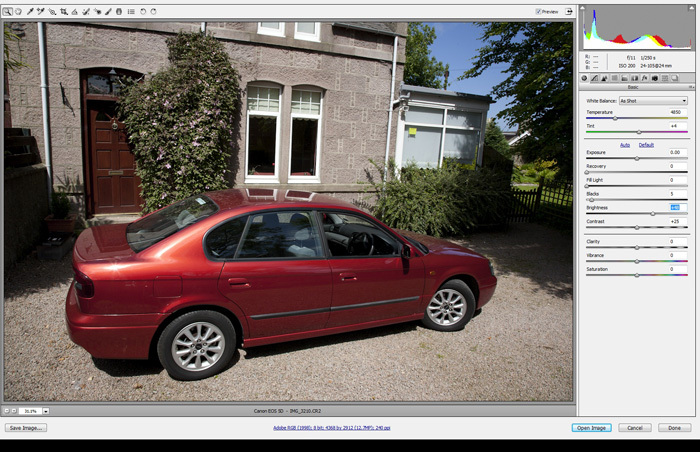 Photoshop CS5 has new features but it, and ACR 6 now look old fashioned in comparison to Lightroom 3.